Yesterday I shot this quick video during my daughter's practice. I didn't have time to clean up or do my hair and make-up, it's a raw video, but that is because I had to catch this girl in the moment. Emma was practicing so well and I went in to check up on her and she had this set up with three different cube timers and a bead counter. She was practicing spots slowly and over and over and organizing her practice so she could get everything done. Here it is - it's only 1:15 minutes long. Enjoy! Here is another post about the cube timer. Cube timers are available here on my website! Spirit Sticks have gotten super popular lately. I have been adding new fun Spirit Sticks to The Practice Shoppe and asked previous buyers for feedback about what I should stock. The feedback was overwhelmingly positive. This year in my own studio I gave everyone a Keep Calm, I'm a Musician Spirit ring at their first group lesson. Each group lesson or recital there is a theme and those who participate get a Spirit Stick. Also, we have a Christmas recital coming up and when the kids pass off all of their pieces they get a Christmas Spirit Stick. I'm hoping by the end of the year they will be excited by their collection and remember all the fun times and music memories they made throughout the year. I like the idea of non-sugar treats! I think they are very nice and inexpensive ways for teachers to give acknowledgment. I hand out the spirit sticks when my students bring back a chart completed. So if the assignment is for 100x and they bring a chart back filled in, they get one of the spirit sticks. Most attach them to their violin cases with a key ring and they love comparing them at group class! I teach college students about how to teach elementary music and consult in schools, helping elementary music teachers, and these are VERY popular for students to earn as rewards. I have too much fun buying things for my students from your site. I normally have certain challenges or games that I run in the fall and winter to inspire and motivate. Right now we are doing a Bingo Challenge. I think I actually got the idea from your downloads page. I created my own with activities like 100 repetitions, listen before bed, polish a piece, observe a lesson, go to a concert, help someone in group class, etc. I think I will introduce the spirit sticks and give them to the winners. Those who continue to complete challenges on the Bingo card can work towards earning more spirit sticks or other prizes throughout the year. I love them all !! I am addicted to spirit sticks! 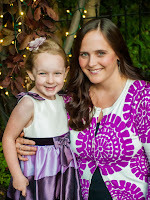 I am the mother of three and work full time as a mental health therapist. My client's love to collect them and feel proud to have them as their flags of success or special collectible. I LOVE the spirit sticks!! I have 10 students plus my two own sons learning violin. All my students are excited about the spirit sticks incentive program that I am going to introduce to their parents at upcoming Halloween recital. Each student will receive a spirit stick for participating in the recital. I plan to add several varieties of Spirit Sticks in 2015 including Listening Awards, Review Awards, Practice Makes it Easy, Book 1, 2, 3, graduation, etc. Please let me know if you have any ideas for Spirit Sticks that I can get made. *Choice of music dice depending on what needs to be worked on. Put 10 playing pieces between the two players (dominoes, skittles, pennies, etc.) The student rolls the die and names it. If she can name it correctly she gets one of the game pieces. If teacher/parent needs to help the parent/teacher gets the game piece. Continue to do this until all the pieces are gone. The person with the most game pieces at the end is the winner. Continue to play this each day until the student can get all 10 game pieces easily. * Great to play in a group or private lesson - especially piano and guitar. Teacher rolls the dice and students search for dice to build 3 note chords. Students get one point for each chord. Play several rounds. The student with the most points at the end of final round wins.! * Great to play in a private lesson - any instrument. * Another great game to play in a private lesson- any instrument. The teacher chooses a musical note from a song the student is playing to be the Oops note. Student rolls the die and uses that accidental whenever the Oops note appears in the song. For example if the Oops note is A and the student rolls a #, the student must play A# whenever an A appears in the song. This game will help students hear how accidentals change the sound within a song. * Group class or private lesson. At the start of the game the teacher and/or students choose a funny word or silly phrase. Examples: “Cantankerous” “Didgeridoo”. When the student rolls the die they will say the funny word or silly phrase using that dynamic. In a group setting, everyone can take turns saying the funny word or silly phrase using different expression like a question, exclamation, happy, sad, etc. * Notes Dice (16th), Notes Dice (2-8ths), or Notes and Rests Die. Players take turn rolling the die. The time value of the note is your score - write it down. The first player to get 24 beats is the winner. This game can be made more difficult by requiring that each measure be completed before starting the next measure. 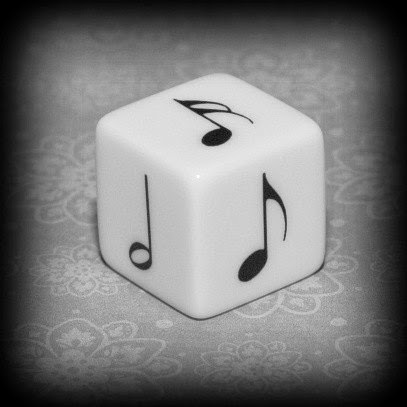 Roll the Time Signature Dice to determine the time signature of the passage you will play with. Space 8 bars on your sheet of staff paper. Select which Notes Dice you will roll. Use the note or rest you roll to fill all or part of a measure. If you cannot use the note or rest which appears, you must wait for your next turn. The winner is the first player to fill up eight measures of rhythm. * Time Signature Die and choice of Pentatonic Dice, Rhythm Dice. * Great for home practicing. Student will start the practice session by writing a clef on their staff paper (treble or bass - if you are using another clef you will want to use the Lines and Spaces dice instead of the Pentatonic Dice.) After the initial warm-up the student can roll the Time Signature die to determine the time signature of her piece. Write it on the paper. Between each piece or activity during practicing the student can roll the Pentatonic Die and a Rhythm die and fill in the staff paper with her piece. When practicing is over she can play her piece or have mom or teacher play it. See what great music can come after a great practice session! a ball or beanbag into a bucket. correctly answers and the team with the most points wins. * Any chart with 100 (or more) squares or spaces. Roll the dice clap the rhythms. Then count the number of beats and move a game piece that number of spaces on the board. A student can play this on her own or with a parent or other student. Both students roll their die at the same time. The note with the higher note value gets a game piece. If the note values are the same WAR begins. Double the amount of pieces and roll again. The winner gets the game pieces. If it’s the same value again double the game pieces again. When all the game pieces are gone the winner is the one with most game pieces. The student rolls the die and places a small object like an eraser on the corresponding keys on the piano. This game can be played with a timer by having the student play up to 6 rounds trying to get faster each time. Record fastest time and try to beat the record at the next lesson. This can be played in a group any instrument. until all the die are taken. The student with the most dice wins. I made up this game to add variety to another game that I made for my daughter (I'll post soon!) This is a really quick game that involves any of the music dice and it takes about 2 minutes or less to play. 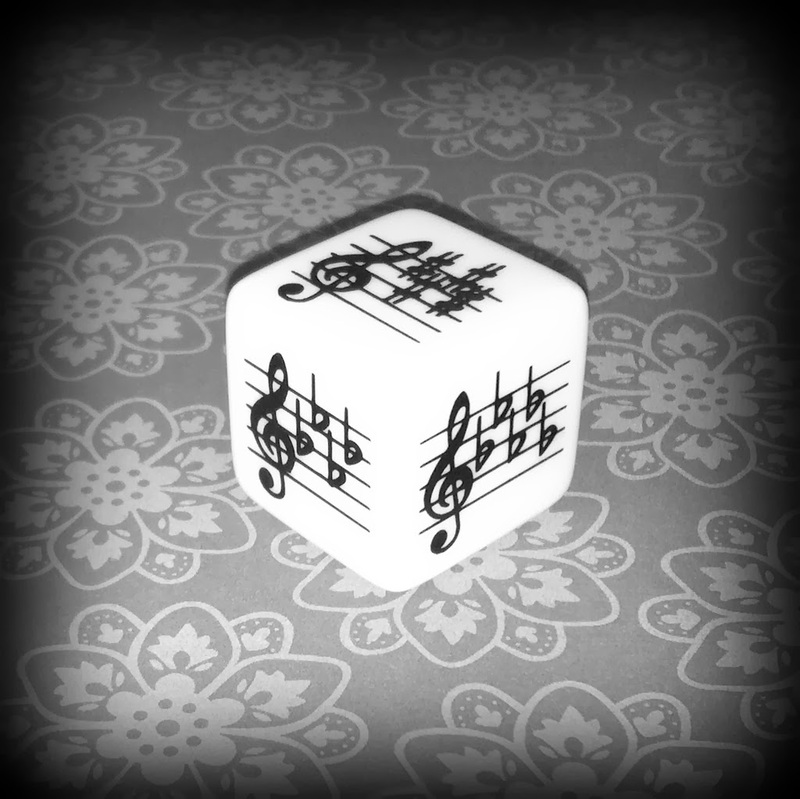 We played it with the 16th note rhythm dice, but you could use any of the music dice. Put down 10 dominoes (you could use pennies, jewels, or any kind of item that you could lay out.) Have your child roll the music die and tell you the name of the note. If she successfully tells you the note, she gets a domino. If she is incorrect or if you need to help her, you get the domino. Whoever has the most dominoes at the end wins. The thing I love about this game is that the more you play it the more successful your child will be at winning so that makes them want to play it more. This was a great way for my 4 year old to learn the different kinds of notes. Once she gets this mastered I will move on to the number of beats of each note, then another kind of dice. It takes hardly any time to play, it's a fun way to learn basic concepts because it's natural for the child to want to earn all of the dominoes. Since it's only ten rolls it's not overwhelming or frustrating. Hope this helps someone make practicing more fun.